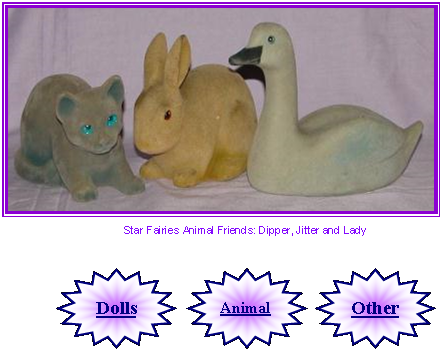 Star Fairies “ANIMAL Friends” were made in mid-1980's by Tonka Toys. 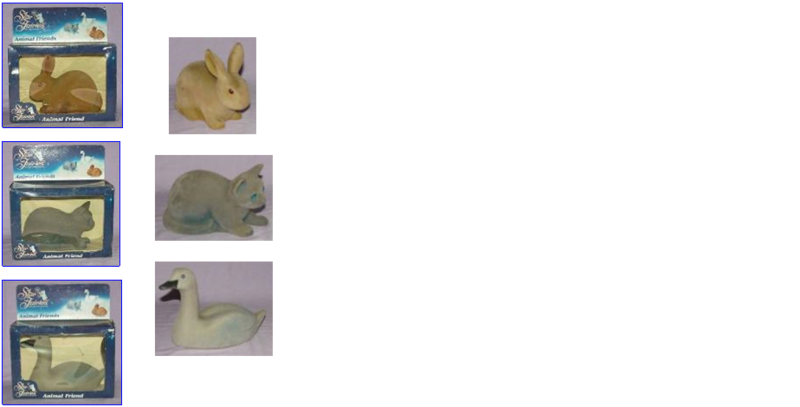 There were THREE animals that were a part of this series. They were especially designed so that the Star Fairies could easily sit on them. Made of a squishy PVC with a flocking. The eyes have "stars" on them and the bottoms are stamped TONKA Corp. 1985. 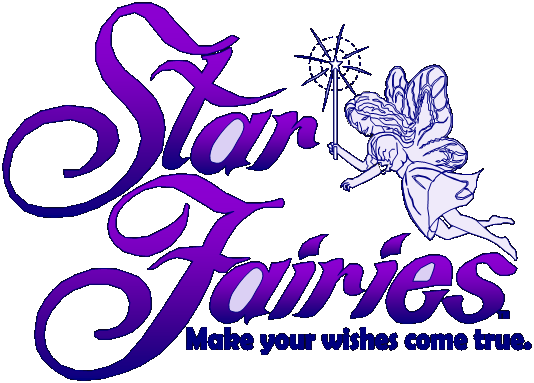 Star Fairies “Lavender” the magical unicorn was made in mid-1980's by Tonka Toys. There were two versions; Lavender sold by herself and Lavender sold with the “Star Coach”. Nicely sculpted features, this lovely lavender colored unicorn/pegasus has silky white hair mane/tail and pearl horn. Like the Star Fairies she has clip-on pale pink and lavender wings which attach to a bar located on her sides. Underneath the bar is a small protrusion so that the “Star Coach” could also be attached for her to whisk the fairies away to the Land of WishComeTrue up in the clouds and Castle WishStar. Lavender also came with her own hair brush. Sadly however, there are no markings on the hard plastic body of this horse. It is curious that I have seen a number imprinted on the inside of some of the coaches but the number doesn’t appear on all units. lavender colored body with white hair mane & tail. 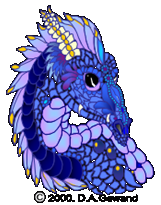 7 1/4" high, 9 1/2" length (to horn tip) about 2 1/2" wide (at widest part of body). Wing span is 11 1/2" (from tip-to-tip). The Star Coach is pale pink exterior w/ lavender interior. Lavender wheels and silver highlights. Special ledge on rear allows the feet of a doll to be inserted so that it can stand on back. 7 1/2" high, 13 1/2" long about 6" at widest (wheel span) width. 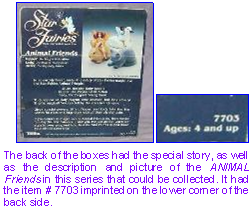 The original box had an illustration of Lavender with the Star Coach, the back of the box featured her story as well as a photo showing Lavender with two of the Star Fairies (Sparkle & True Love). The top of the box also had a picture as well as summary of the contents and features of the Star Coach. The Star Coach had a special ledge on the back so that a doll could stand behind the coach (her feet slipped between the two ledges as shown in photos above). The item # 7705 was imprinted in the corner of the box on all sides.